Vintage Indian poster for sale of the old Hindi movie, Hamari Jung (1987). This is an actual surviving old Indian movie poster for sale of the 1987 Hindi action film that was directed by Rajesh Bahaduri. This old Indian movie poster for sale was originally designed and printed for publicity of the film somewhere in the late 1980s but never ended up being used. 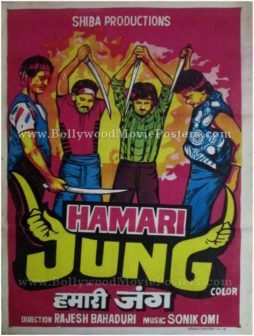 Hamari Jung was an action drama based on the story of four vigilantes who take on a dangerous gang (called the Cobra gang) that has been terrorizing their neighborhood. This vintage Indian poster for sale was originally hand drawn on canvas by a small time art studio in Kolkata giving it a very quirky appearance. The four vigilantes are seen in a quirky hand drawn avatar wielding swords. Interesting typography is seen at the bottom in the title of this vintage Indian poster for sale. The entire poster is set against a bright background giving it a very catchy appearance.